Taking part in the National Novel Writing Month, achieving the winner’s 50,000 word badge and working full time! …just to name a few! 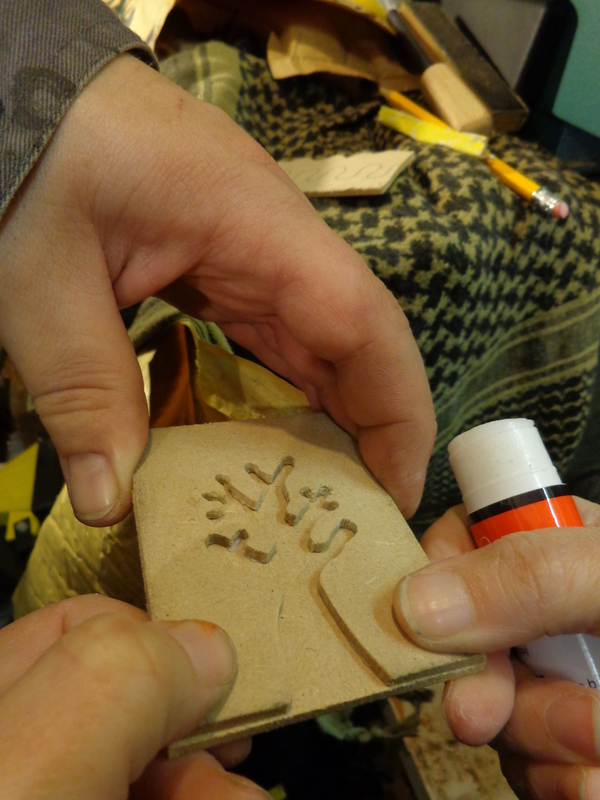 There have also been many crafts I’ve revisited and enjoyed very much such as drawing and sketching, book making, lino cutting and printing, pyrography and writing haiku. Time and again, I reminded myself that it would be a huge challenge to produce a craft a day as this blog suggests in its name. I mostly achieved that – and sometimes posted more than one post in a day – until I began to work full time and seeing my son go off to uni. It was only when we got to November I reasoned with myself that I could produce better work if I spent more time on it than pushing myself to get that blog post out before midnight! There have only been a few days when I’ve not added a blog entry … that’s only recently. This is because I’ve realised there are some things that need to stay hidden for a bit so that ideas can grow and creativity can happen :-). Also, some opportunities happen when you least expect them … and aren’t even consciously looking for them (such as when I found the route to buying my first printing press) and having one of illustrations published (outside of the blogesphere) this week!!! That really was exciting! Now, I have editing to do on my newly written novel – a creative journey in itself, so if this blog goes quiet you’ll know that I am still busy creating. But … I’ll be back and hope that you will drop by and say hello in the comments now and again. 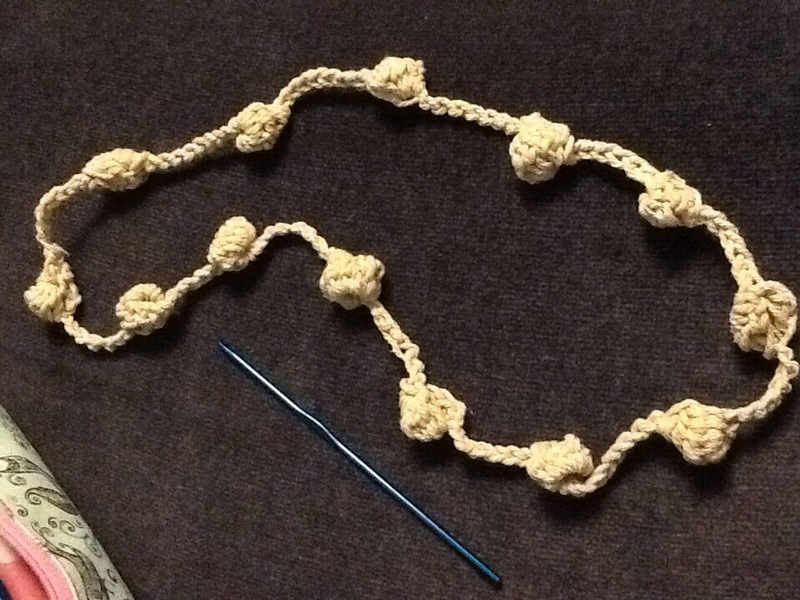 Meanwhile, here is another first: I’ve never made a crocheted necklace or piece of jewelery before. I was inspired by a colleague wearing a knitted bauble necklace at work today. She had a lovely deep red jumper on and a long necklace. 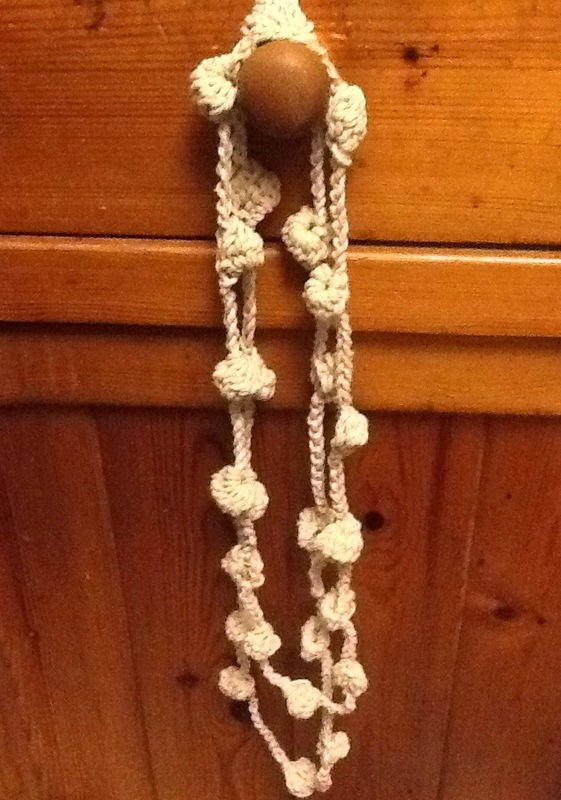 As I’m not keen on knitting, I decided to attempt to make one using a size 3 crochet hook and a ball of cotton string :-). I chose string mainly because I’m not keen on the wool colours I have in my cupboard; each of them were bought with specific projects in mind or I’ve been given random odd balls of yarn by my mum who knits trauma teddies for children who’ve been displaced through natural disasters. 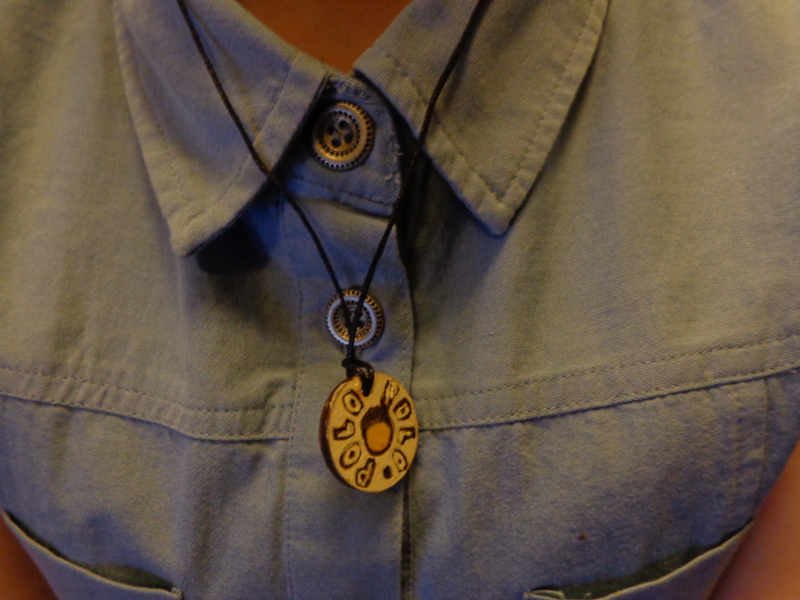 I’m also thinking that I might dye the string now that I’ve made the necklaces. What do you think? 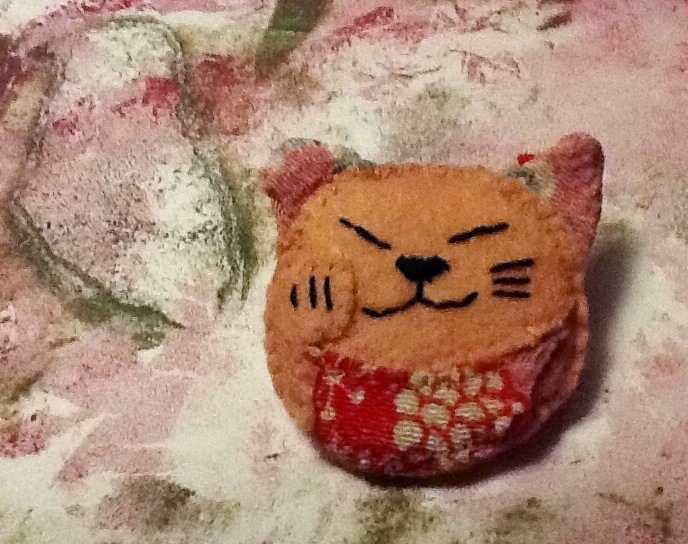 This cat brooch was from a free gift on Craftseller magazine. It’s been sitting around for a few weeks on my table, so with a craft fair stall to plan for, I thought I’d better make a start! 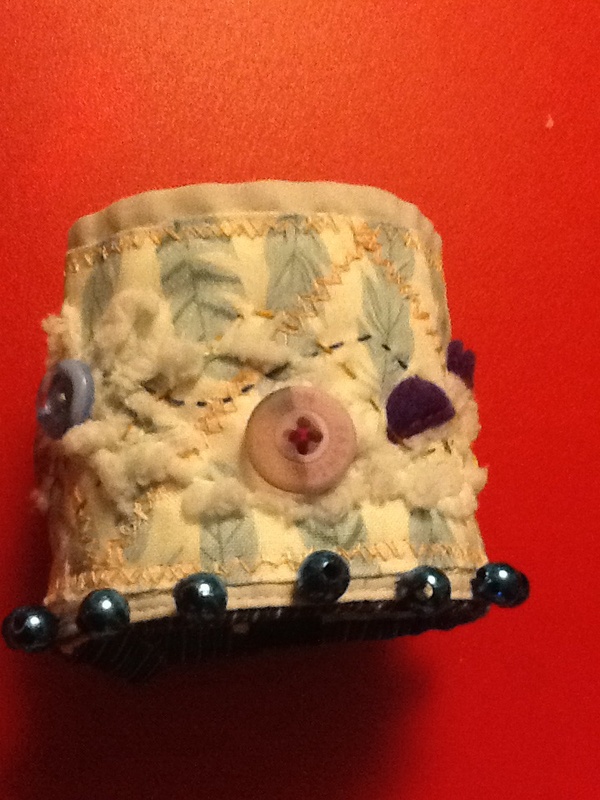 The kit included two pieces of felt, a piece of card, two pieces of floral fabric, some foam and the brooch pins, threads and templates. While I stitched the pieces together, starting with the ears, I wondered whether I could do a similar brooch with the features of a fox. I’ve sketched one out ready. 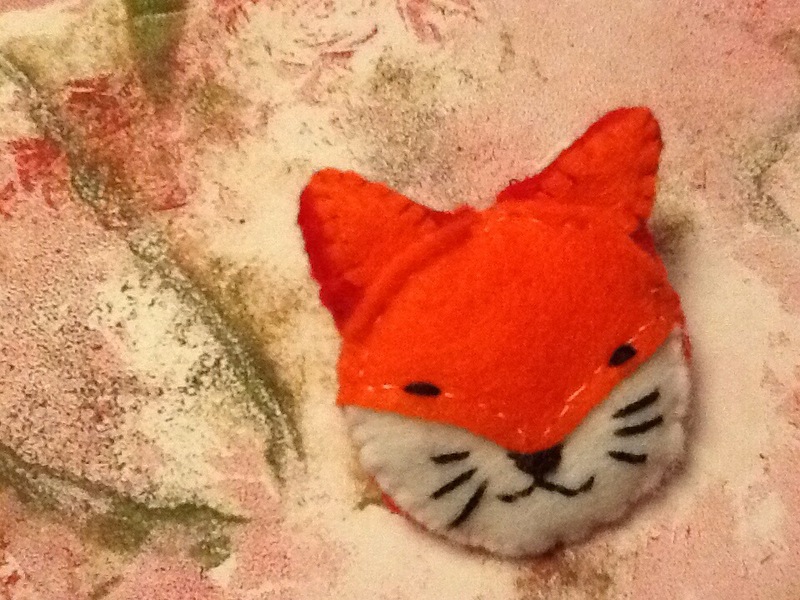 I found some orange, red and white felt in my stash and kept it to the same size as the cat brooch. 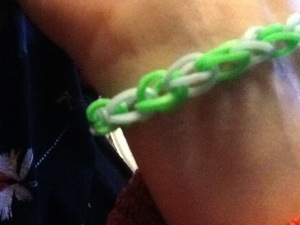 For the last two Fridays I’ve been at an established craft club called ‘Crafty Chat’. There are fifteen regulars who meet every Friday from 11am-1pm and once a month, they meet up from 11-3 and bring along lunch or use the kitty money for fish and chips. I took my mum this week as she recently lost a friend and I thought it might take her mind off things for a couple of hours. Sadly, I won’t be able to go as of next week due to work commitments, but I will definitely consider booking my annual leave so that I can go once in a while to the longer Friday session. 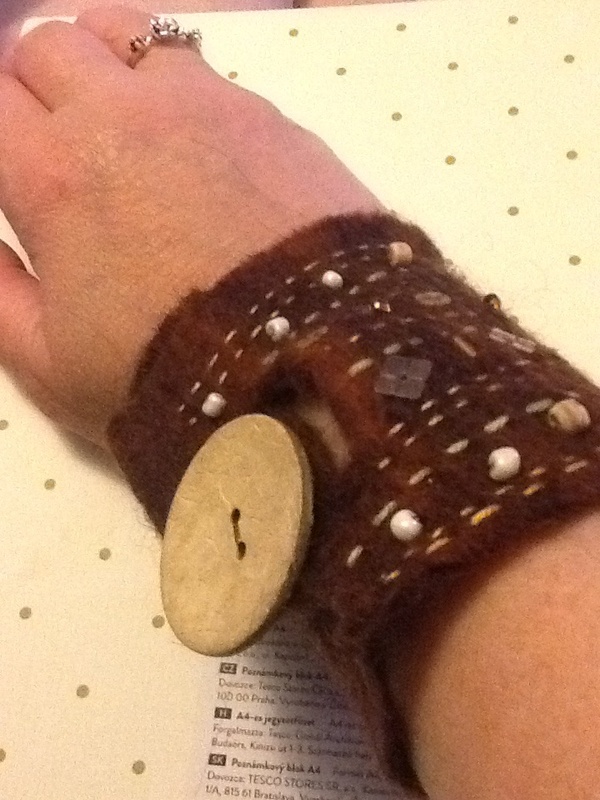 I did a short demo on wrist knitting. It’s great to see that the lady I was teaching picked up the technique really quickly and didn’t end up in a tangled mess. 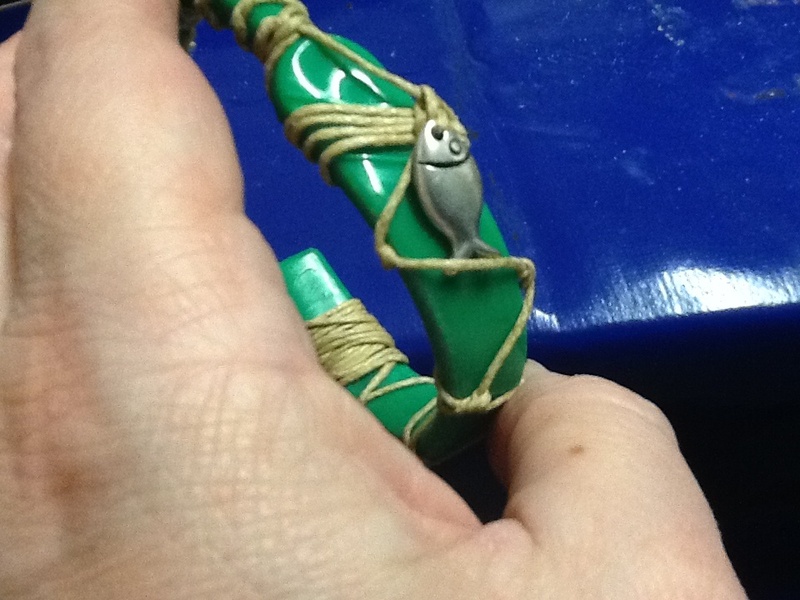 She paints garden gnomes for people and has began jewellery making, using ring pulls from tin cans. 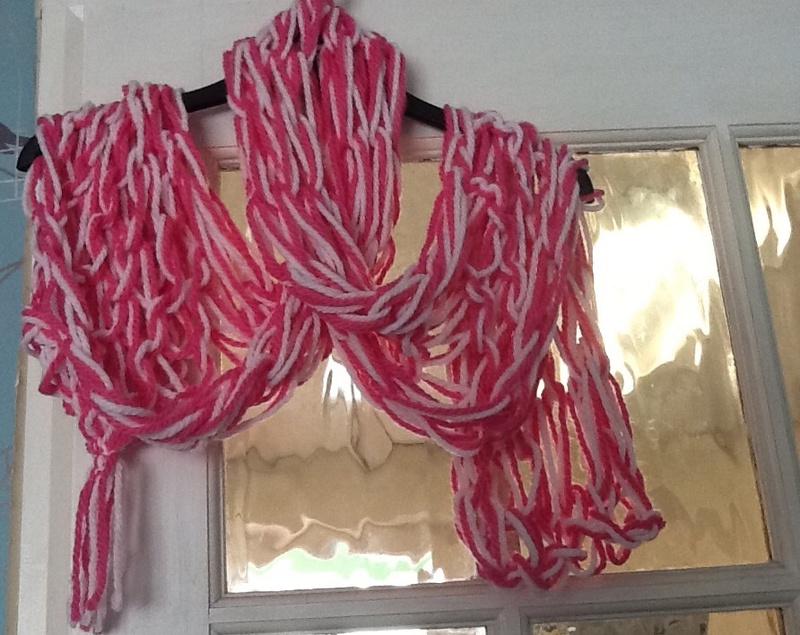 This is a scarf I made a while ago, knitted with my wrists. I had some left over yarn to give my demo, which intrigued the group. It led to a discussion on whether you can take knitting needles on the plane, to which came the reply by someone that as long as your project is already started and you carry it in a clear plastic bag, that’s OK. With wrist knitting, you could knit away without worrying! I blogged about this method of knitting in an earlier posting. So what did I make yesterday? 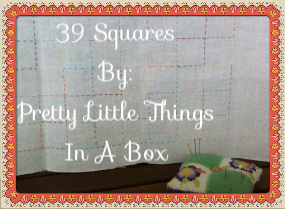 I took along my 39 Squares project and sewing silks. I wanted to try out a new craft though. 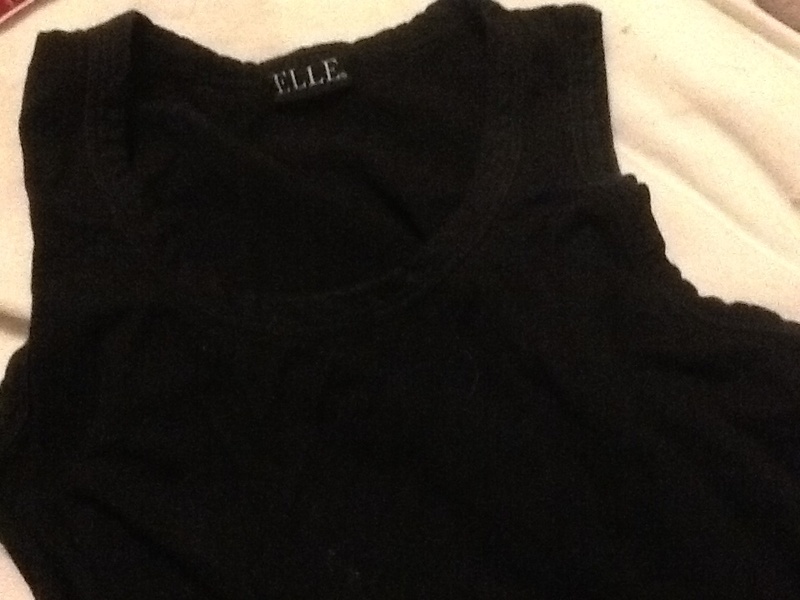 Before I left the house, I cut off one of the cuffs from a shirt that I hardly ever way. 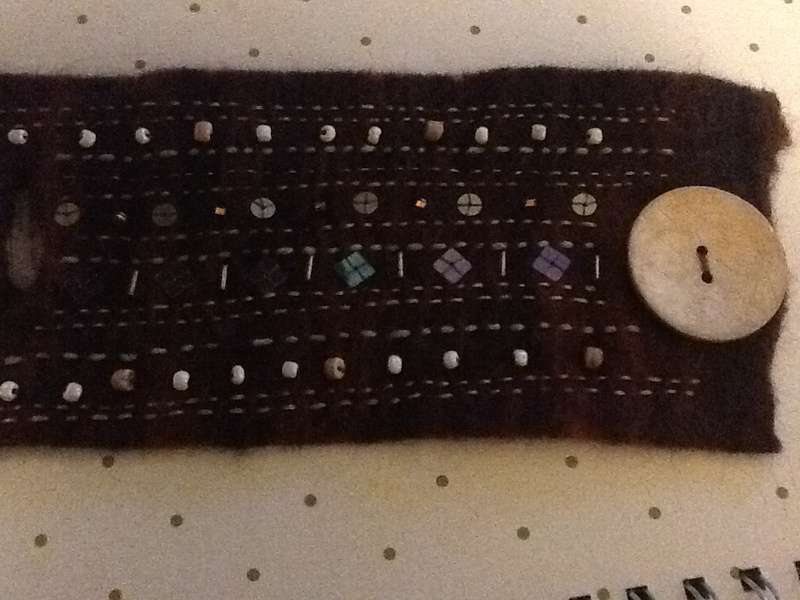 I was inspired by this cuff that was sent to me from a pen pal friend who lives in France – made from wet felting techniques and handstitched. 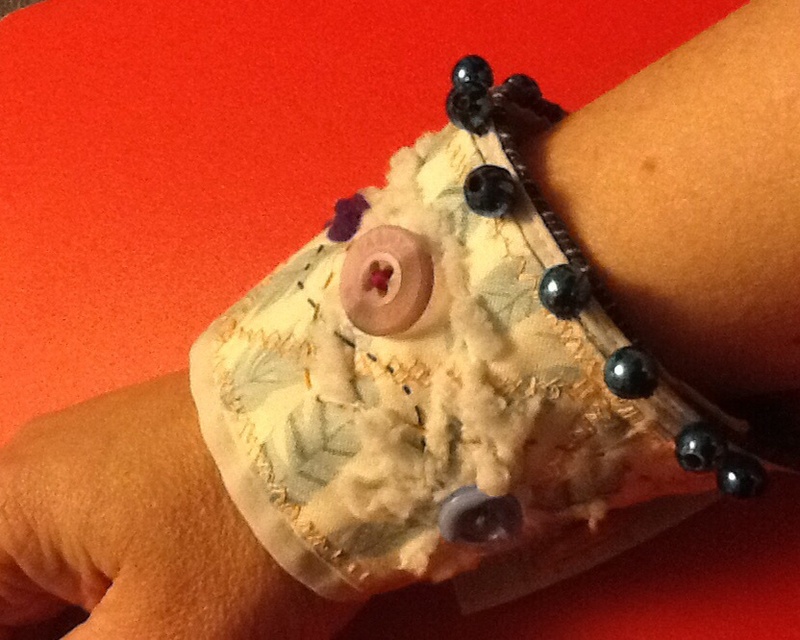 First, I stitched patchwork pieces to the front and back of the cuff as it was plain white – I want to try a patterned one next, but obviously a white canvas means you can test the waters and get creative! 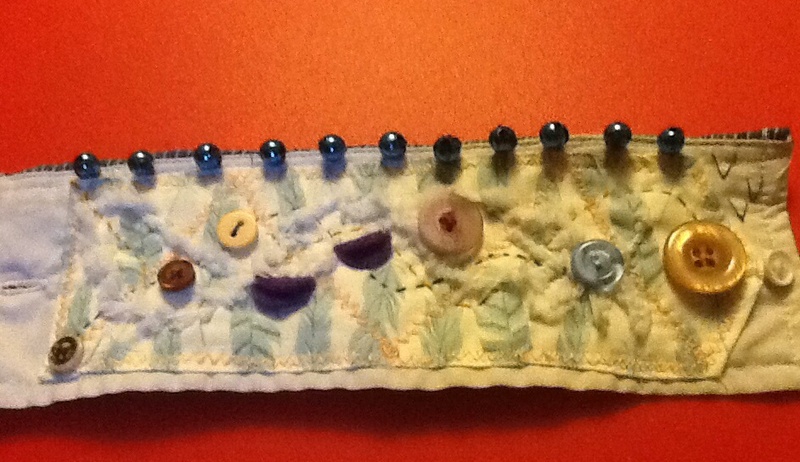 I added felt, buttons, wool and beads. The cuff fits perfectly and the colours are delicate, which is great for summer outings as a statement piece of jewellery and doesn’t cost much to produce if you have some old shirts or blouses lying around. Ever played a game, Cribbage where you stick plastic pins or pegs into a grid? I picked up this at a recent stitch and craft show. For a pound! 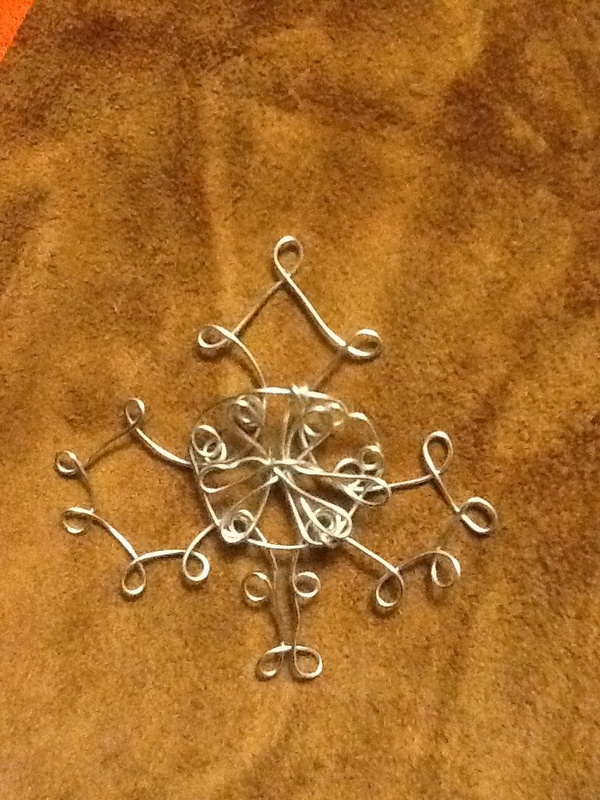 Pins were positioned in a pattern – I attempted to create a tree shape or the clubs symbol from a pack of cards. 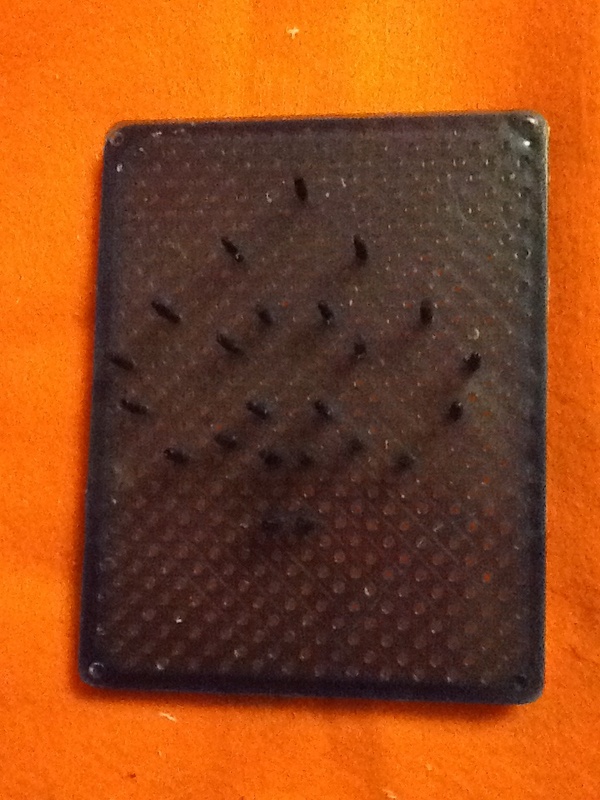 The pack consisted of plastic pins, a plastic holed grid (shown above) and some coiled wire. 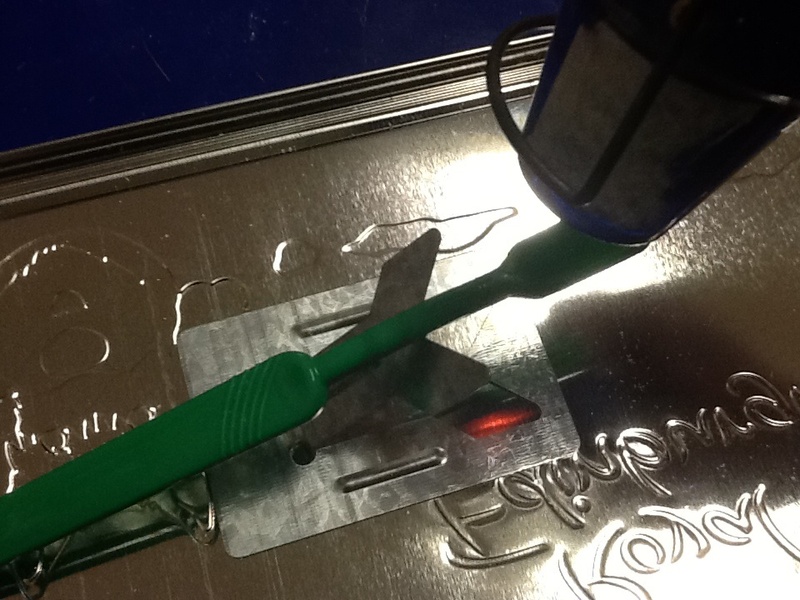 The device, known as a wire jig is designed such that when the pins or pegs are pushed in, you can begin to wrap the wire around each one. This proved a bit frustrating as some pegs resisted and popped right back out, so I found myself trying to catch them mid air! Craft 70/365 a fishy tale! I do have two spare ‘value’ toothbrushes, so could use the remaining one for what you have described (hehe). 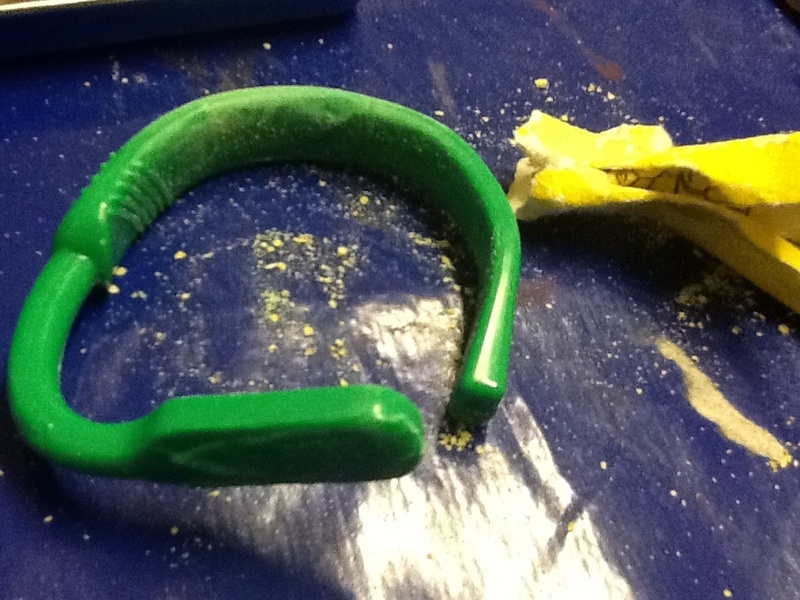 First I removed the bristles and sanded the stubs down to a nice smooth edge. Then, using a heat gun and my pyrography stand to hold the toothbrush, I gently heated up the handle until it became more flexible. I bent the handle into a position that I liked, giving it a slight curve until it was the right shape to fit snugly around my wrist. 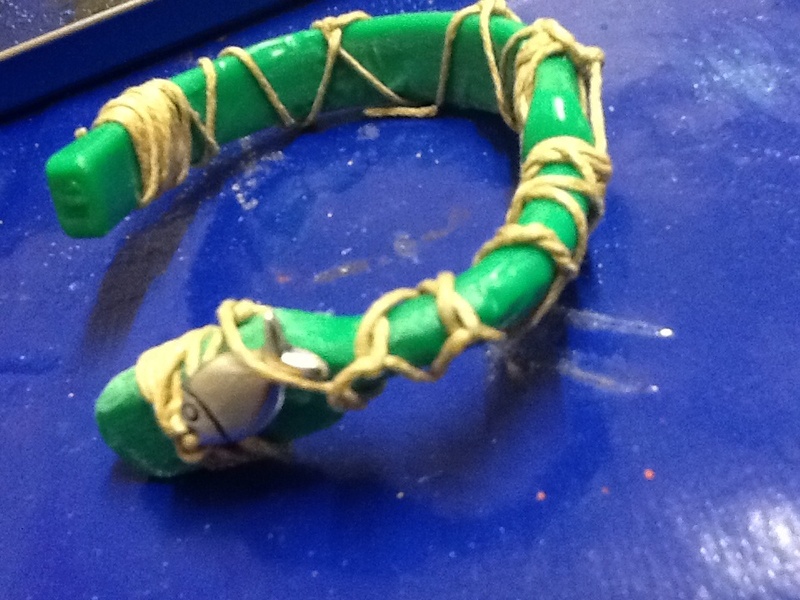 The handle had to be held in place for several seconds before moving onto another section so that the handle began to form into a bangle. After a little more sanding, I chose some brown thread used for beads (so thicker than sewing thread) and wrapped this using a series of knots and ties around the newly formed bangle. Fish were added intermittently for decoration. 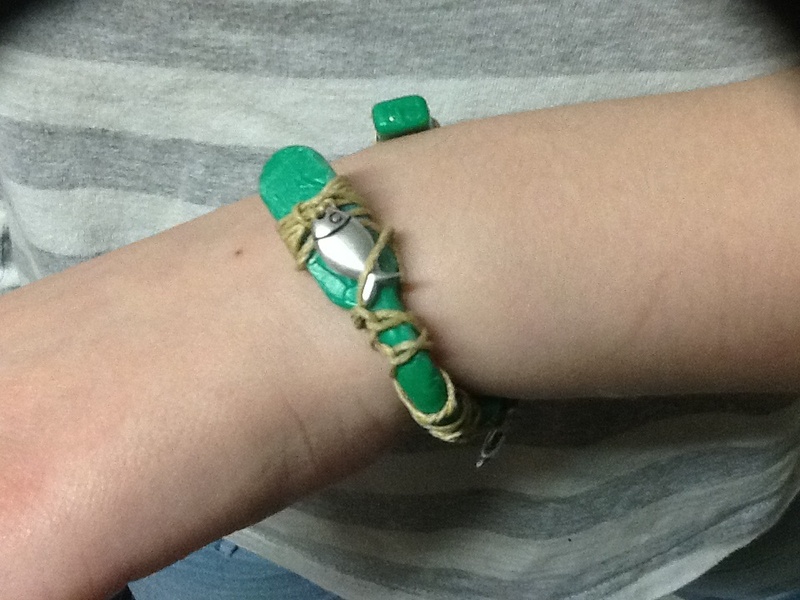 My daughter tried the finished bangle on and seemed pleased with what I had done to a simple toothbrush. 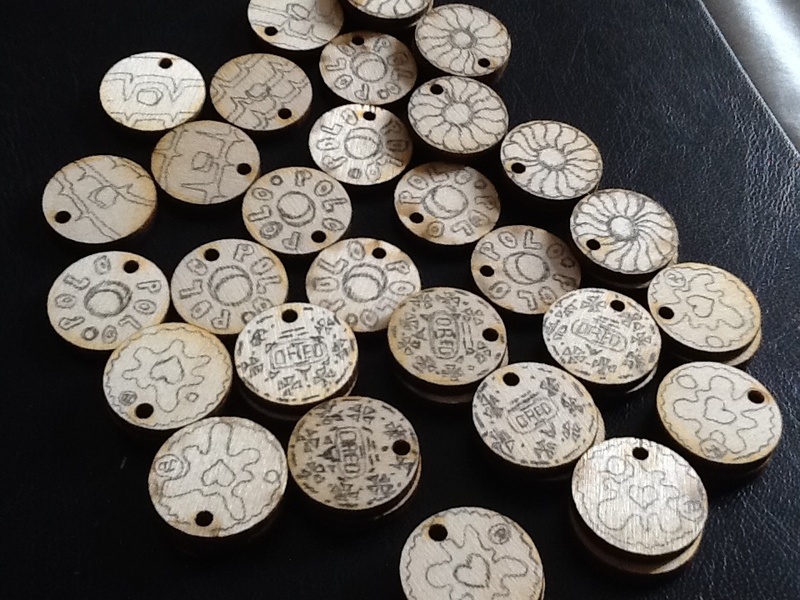 As promised from an earlier post:https://squarebird.wordpress.com/2014/03/10/more-fire-art-coming-soon-but-not-pyrography/ you can now find out what all that ‘fire’ blogging was about! I’m not phased by the sight of a blow torch fired up; a set of gauntlets and wearing goggles but it’s a bit daunting holding a ladle of liquid metal that you have to pour into a small apparture and you can’t quite gauge how much it will hold! This is the first time I have had a go at this craft. 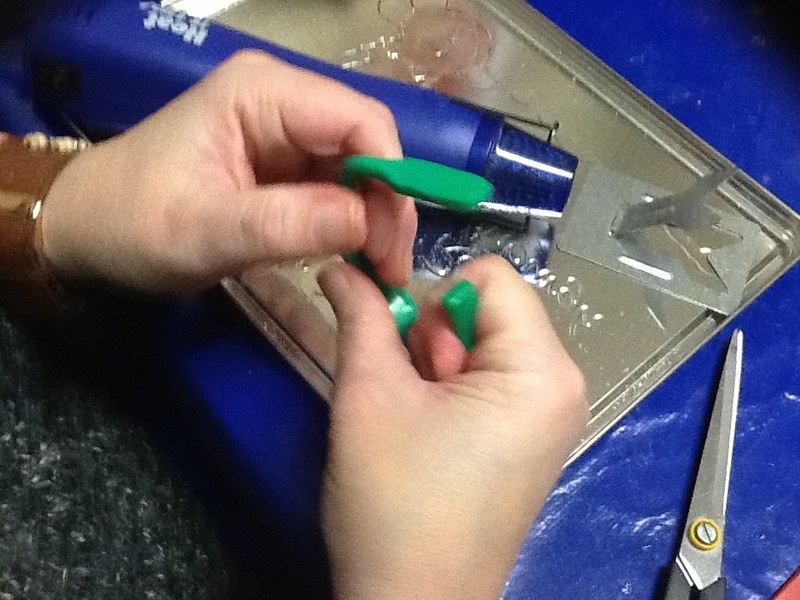 I have watched plenty of students have a go at different technology processes. 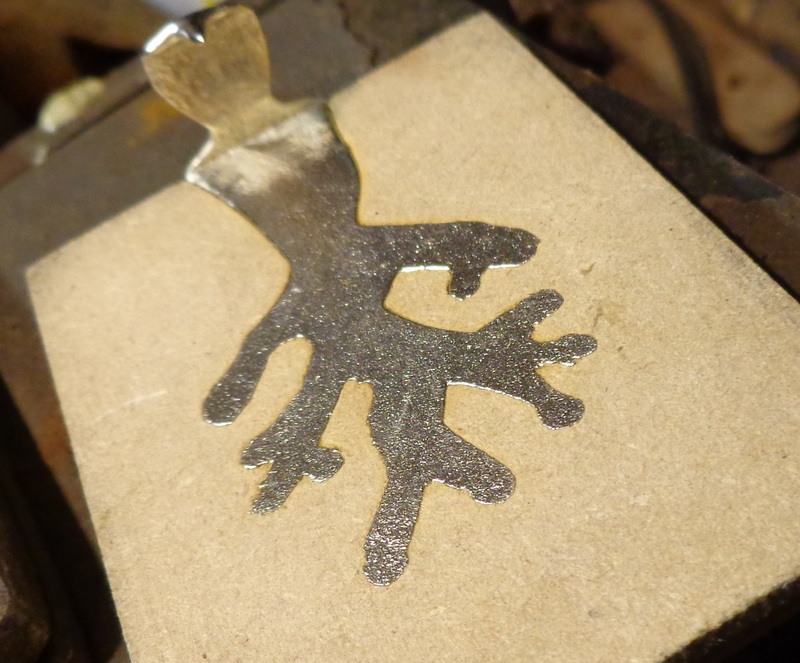 Here is a little intro to pewter casting. I hope you enjoy it as much as I did trying this out. Fortunately my husband has his own forge, blacksmith qualifications and so on; I had someone who knew what he was doing to guide me through the process and let me have a go. 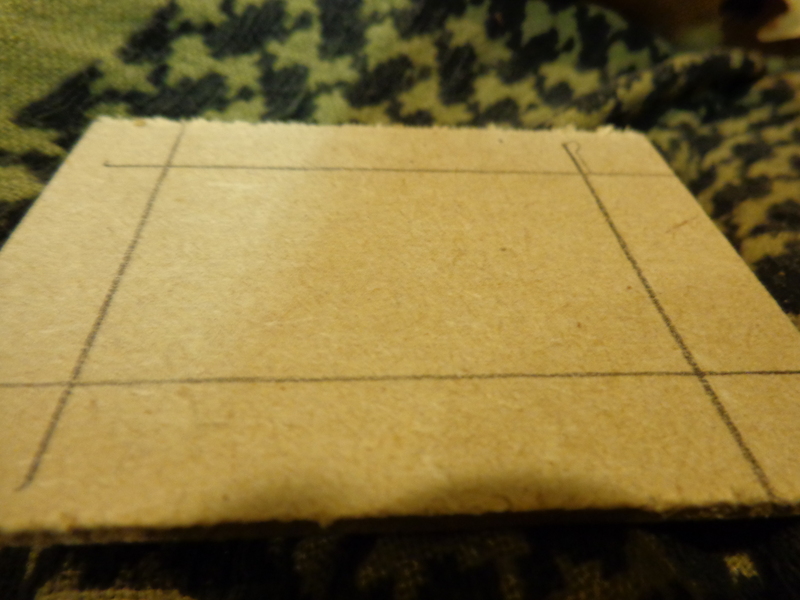 I started off by drawing a frame around my piece of wood and then sketched out a very basic outline. I want to have another go at this, but for now, I drew out a shape of a bird and a tree. 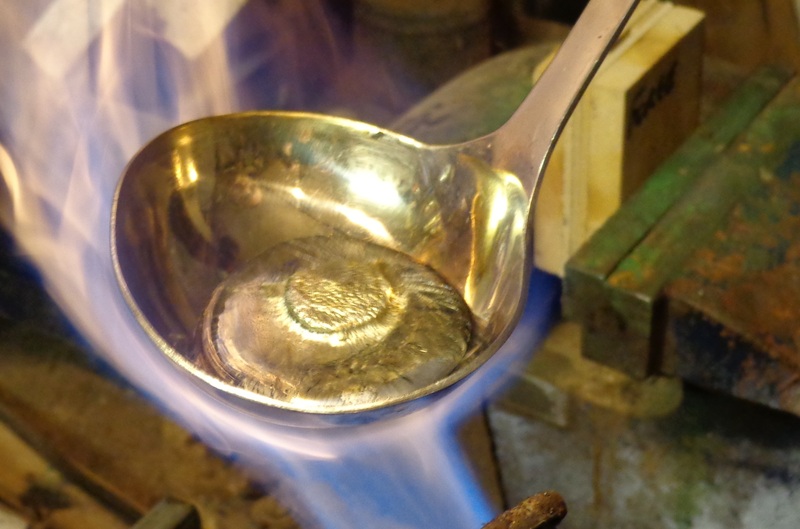 The larger part is the area that the liquid pewter is poured into. 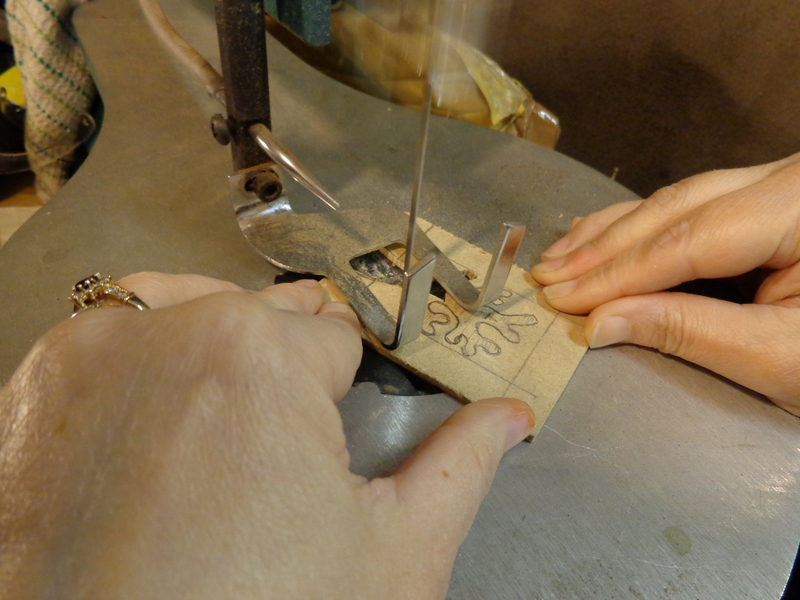 The wood was then placed in front of a thin cutting blade. As the blade only travels in one direction, I had to shift the wood to the position I wanted. This meant not rushing it! My husband suggested drilling the ends of the branches to create holes and this allowed more maneuverability with the blade. 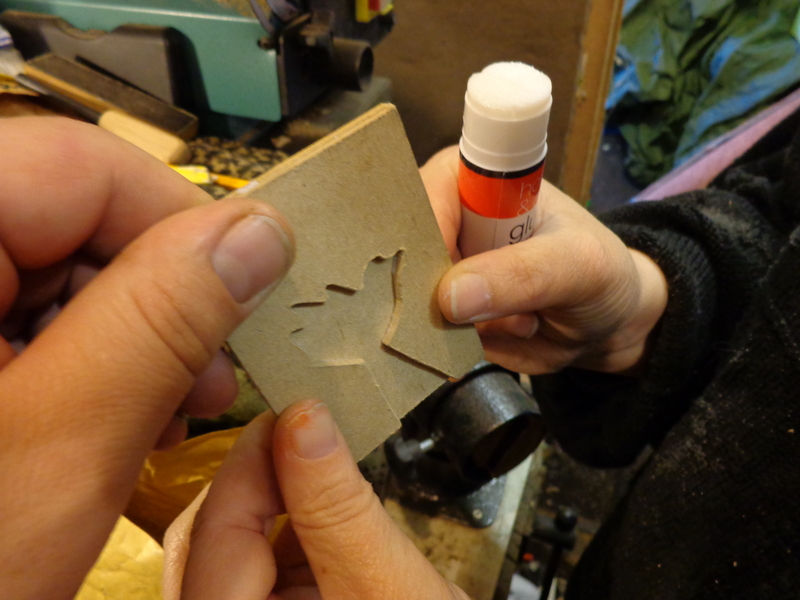 I also worked in triangle formations; cutting small segments out of the centre before heading along the branches. 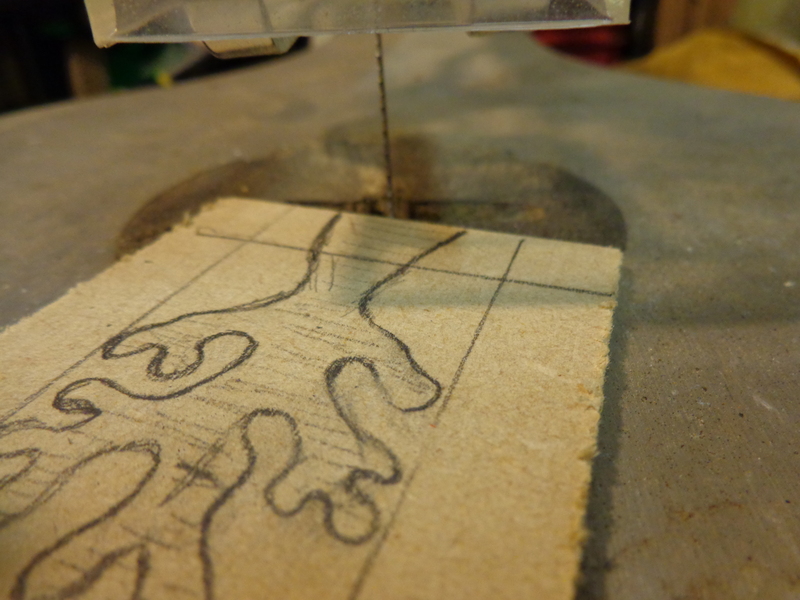 Once the shape had been carefully cut out, I sanded the cutting marks away to form a smooth edge. This was so that when the pewter ran into the grooves it wouldn’t need much filing afterwards. 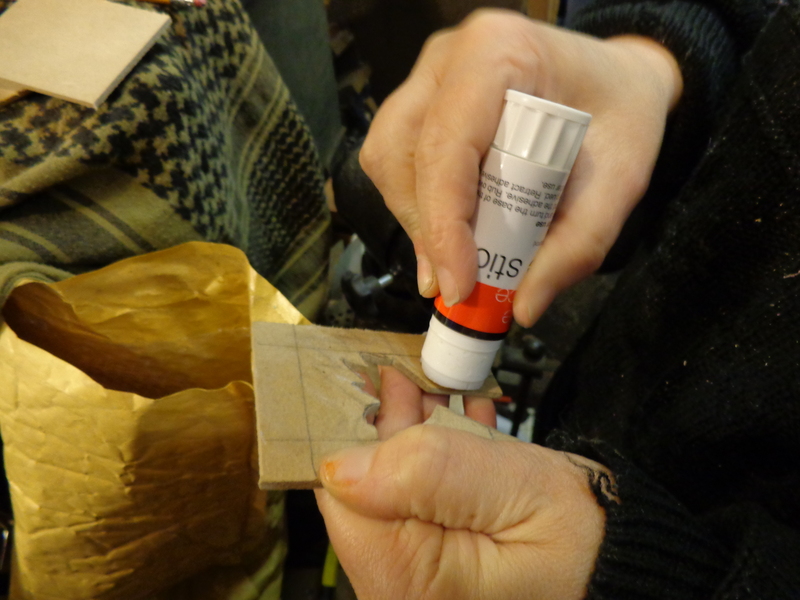 Then the stencil was glued to another piece of wood. 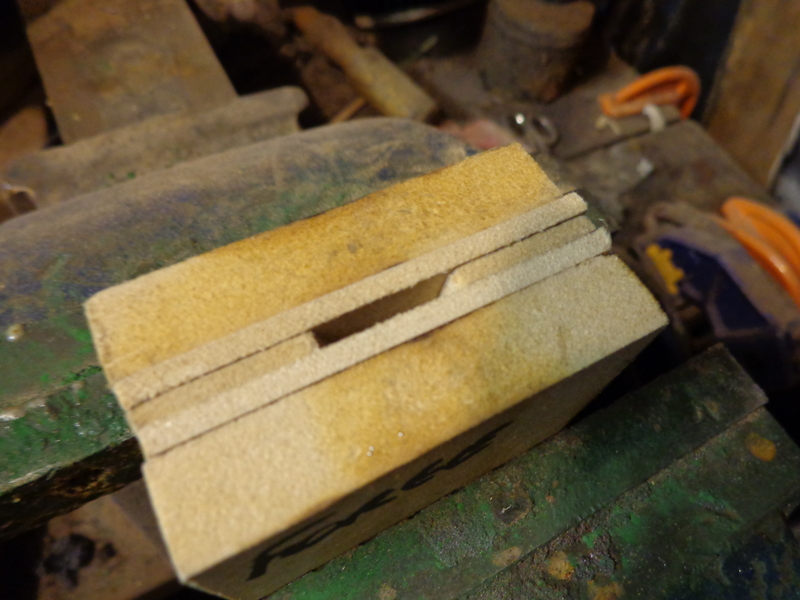 A wood block was placed either side of these two pieces of wood in preparation for going in the vice. 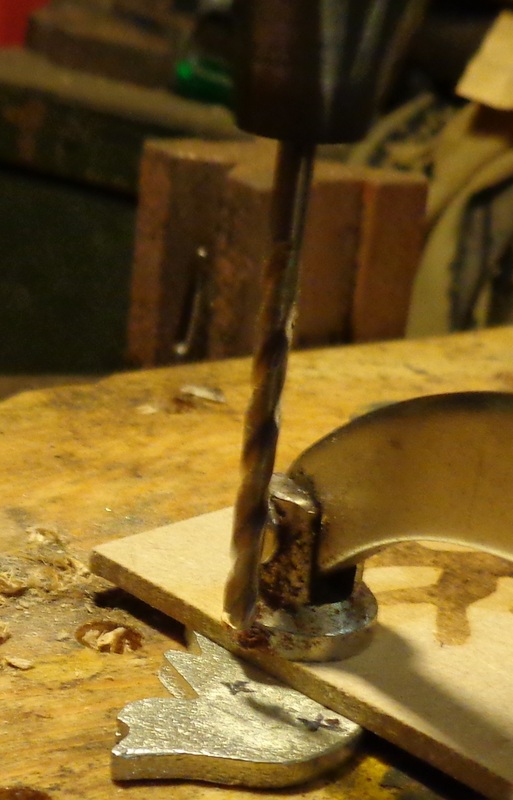 The four pieces are clamped into a vice firmly. 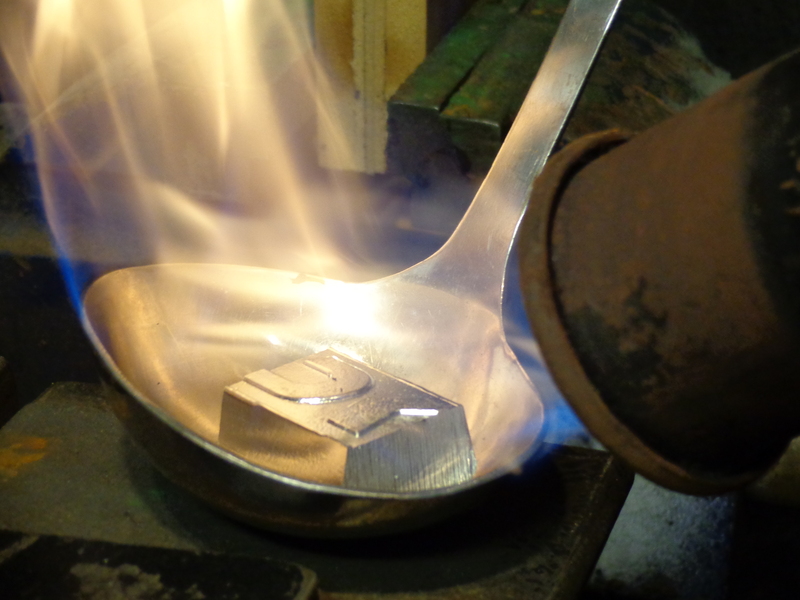 Once secured in the vice with the opening part of the cut out at the top, the pewter was heated up. Very importantly, goggles and gauntlets are worn. Both my husband and I wore boots to protect our feet too. 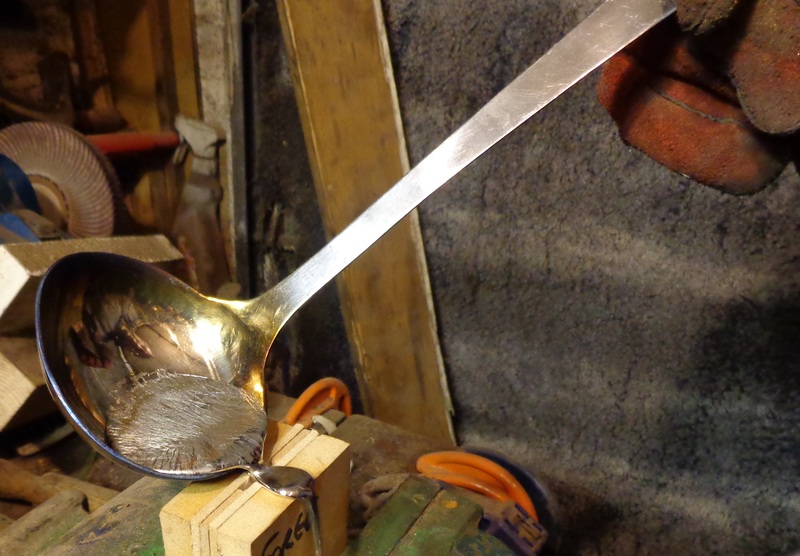 It didn’t take long for the pewter to start looking like something out of The Terminator when it begins to slide and melt in the ladle! 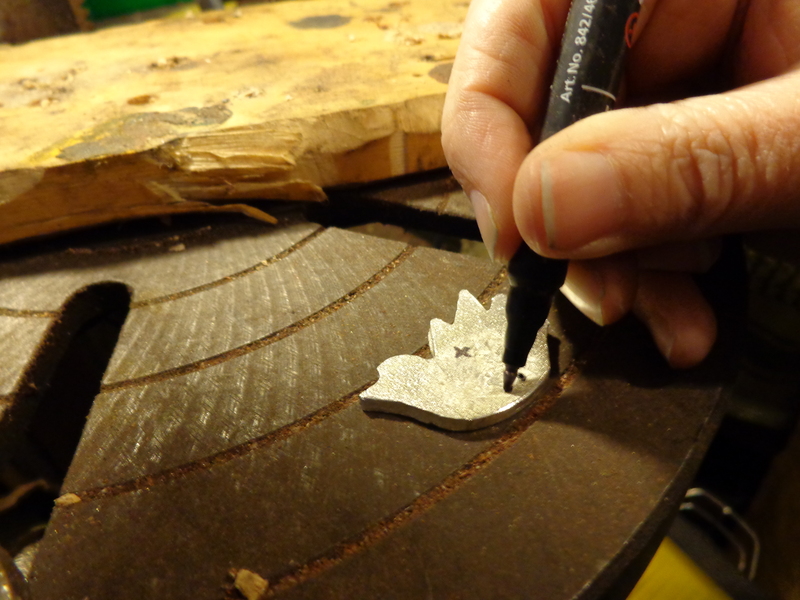 Then the pewter was poured quickly but carefully into the top end of the cutout. 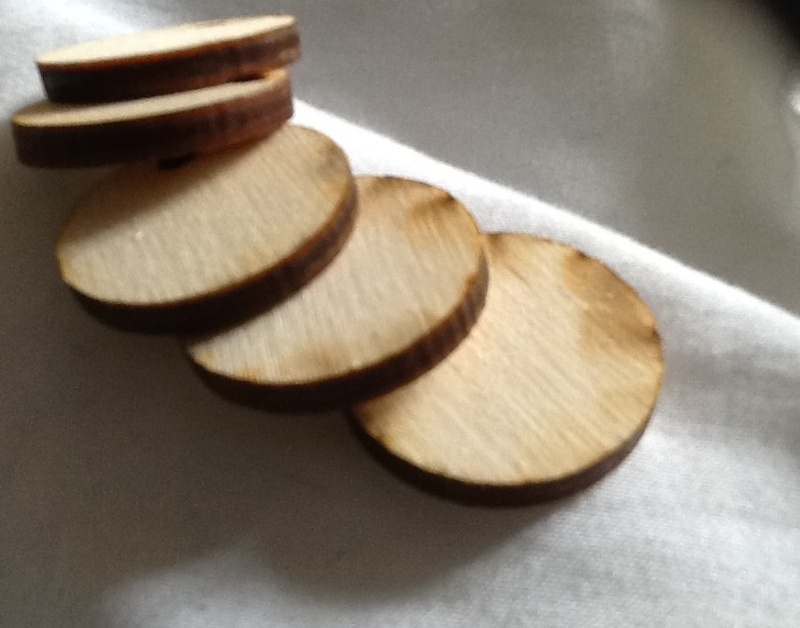 The pewter is left to harden for a few minutes inside the four pieces of wood and once cool, the wood is separated. It’s then possible to lift the pewter out of its ‘stencil’. 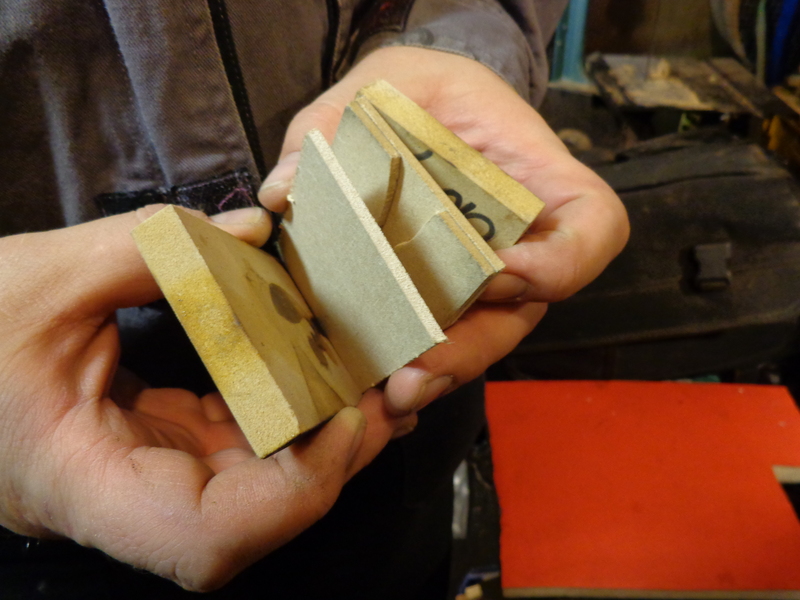 Edges can bit a bit rough, so filing is necessary to get that smooth finish. 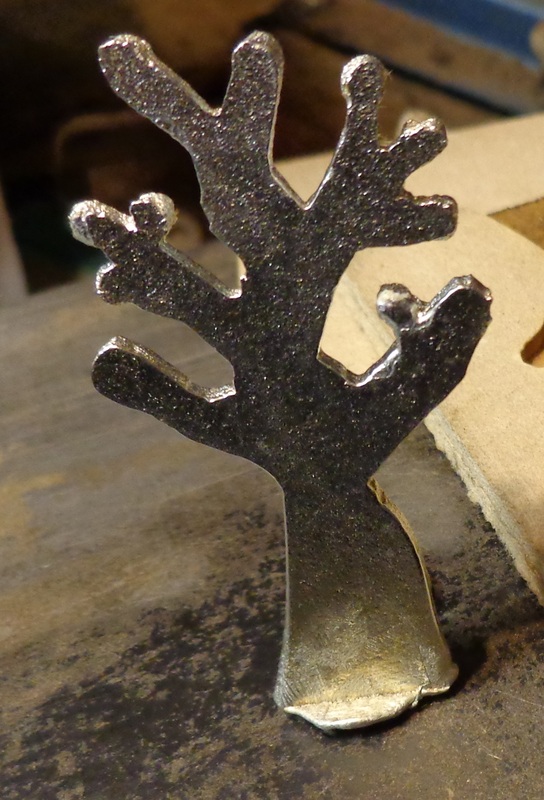 I liked the tree the way it was and didn’t even snap off the excess pewter as it was able to stand up. 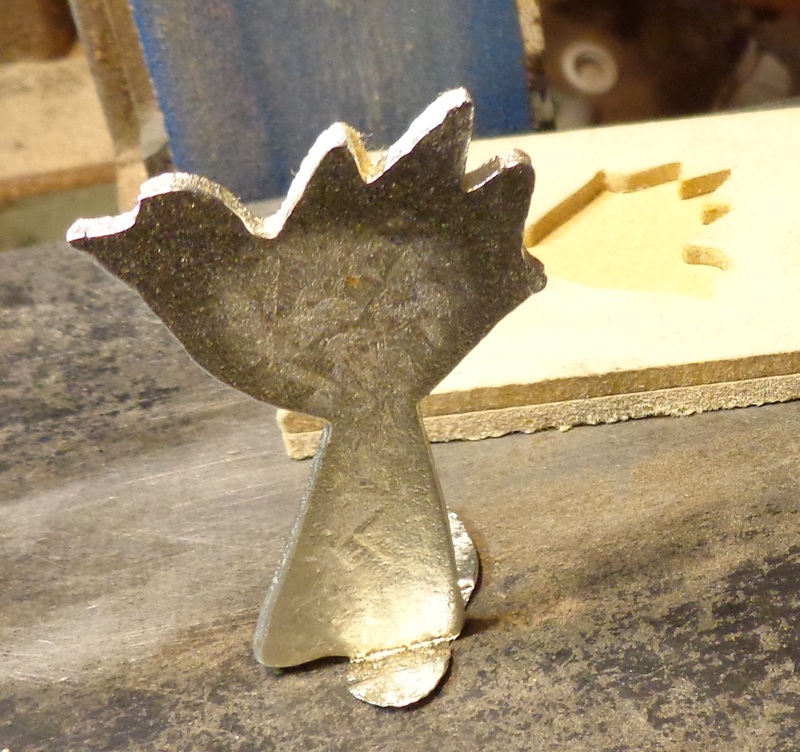 However, I wanted to make some sort of pendant with the bird and so this needed a bit more work. Out came the files, hacksaw, a hammer and a drill. I drew marks for where I wanted the chain to hang and I considered attaching separate legs so that they moved! Roll up, roll up … deadline approaching! March Giveaway!!! Remember you have until midnight Sunday 9th March to comment on my blog (scroll down to the circle with the cross in it, click and then add comment) to let me know which keyring/pendant you would like to win and you will be entered into a free draw. To allow for different time zones, I will pull names out of the hat on Tuesday 11th March). 3. if pendant, please let me know what length chord you would like as some people prefer longer necklaces! 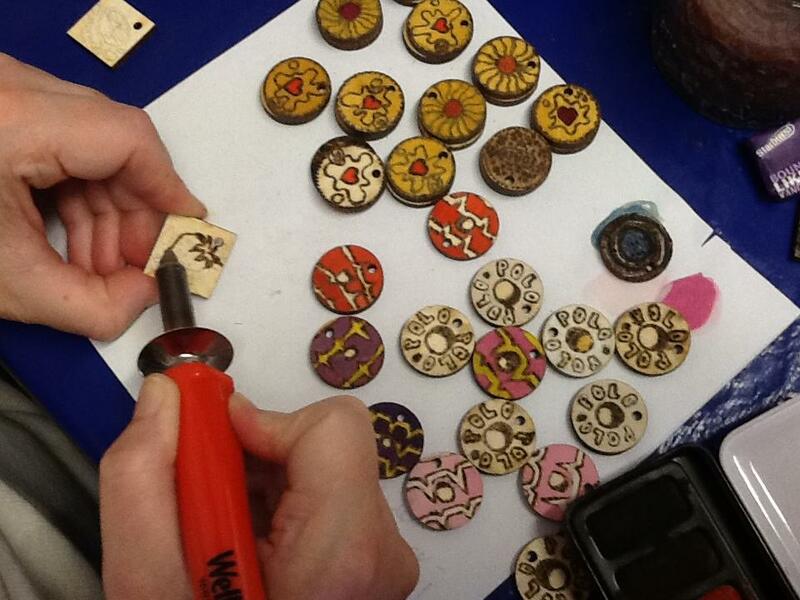 Each biscuit and candy sweet has been pyrographed and then painted by hand before varnishing. 6. 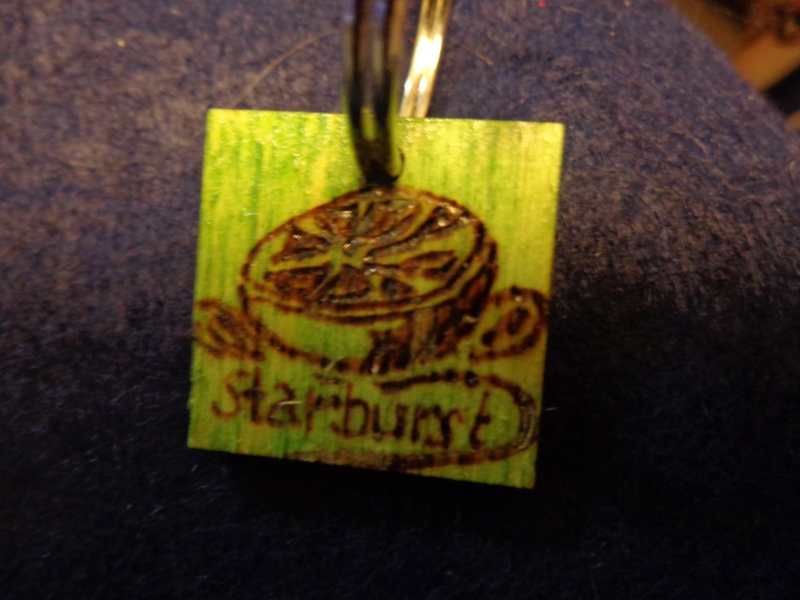 Bonus offer: Square Starburst candy pendant/keyring! (Oh, yes!) 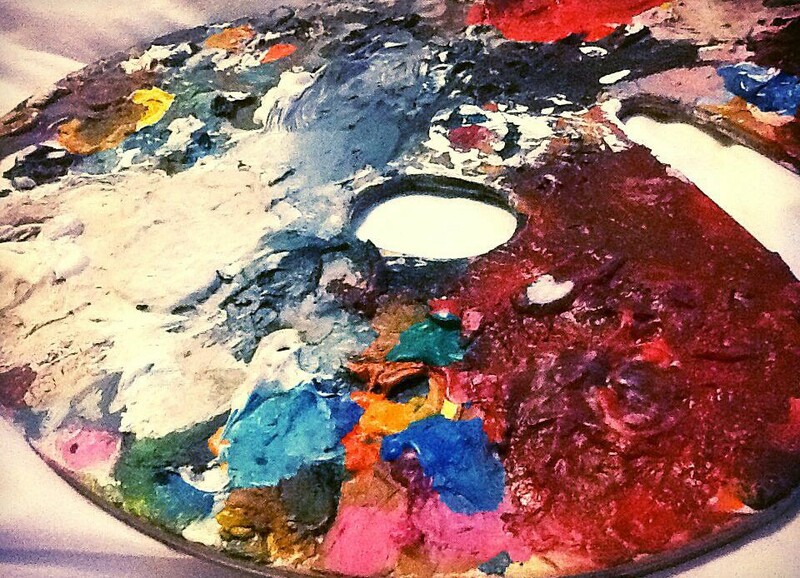 and there is a green, orange, or red one to choose from. I will contact the winner after the announcement on Tuesday evening (UK time) via my blog and Facebook. You can enter more than once for different biscuits or candy. Please note, one winner will be selected from Facebook and one winner will be selected via this blog. (I was feeling generous, because I’ve enjoyed making these so much that there will be TWO prizewinners!). 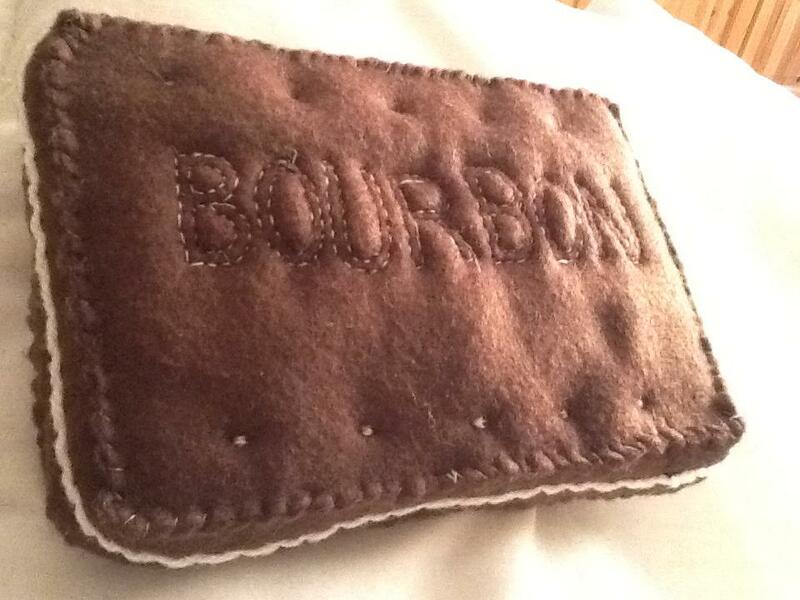 and then … I stitched a giant Bourbon! March Giveaway Contest closes midnight Sunday 9th March! 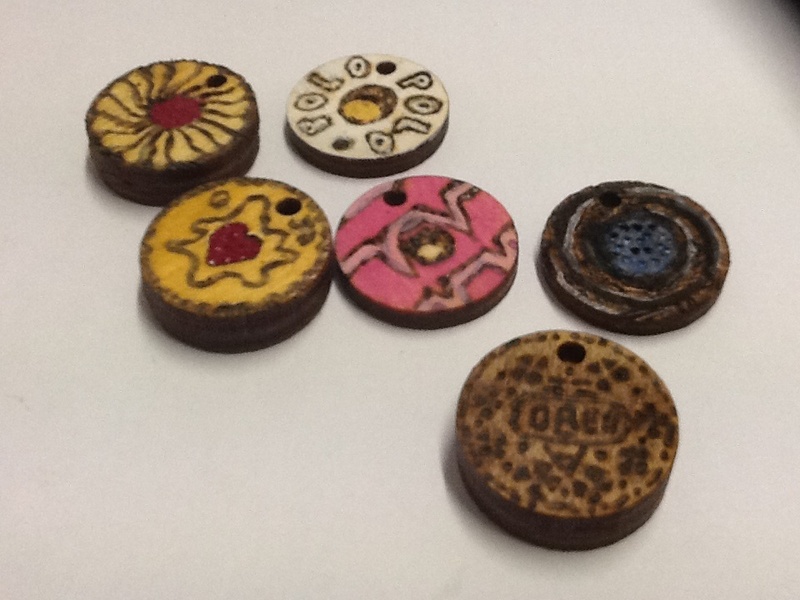 Just in case you have just stopped by to check out my blog, I am offering bloggers (and visitors liking and commenting on my facebook page: http://www.facebook.com/squarebird.co.uk ) the opportunity to win one of my handmade, pyrographed biscuits/cookies/sweets/bon bons/candy! You, the lucky winner can even ask to have your name (or someone you love, if you want to use it as a gift) burned onto the back of the pendant/keyring. Please respond by midnight 9th March and the draw will take place Tuesday 11th March. Please note colours may vary for the iced party ring, but if you have a preference please state and I’ll do my best. Also, if you would like your name or someone else’s name (if it’s going to be a gift) pyrographed on the back of the pendant/keyring and you are the lucky winner, remember to state that too in your comment! Offer closes Sunday March 9th at midnight. To allow for different time zones, I will draw names from a hat Tuesday March 11th and announce the winner on this site. Good luck! Updated! 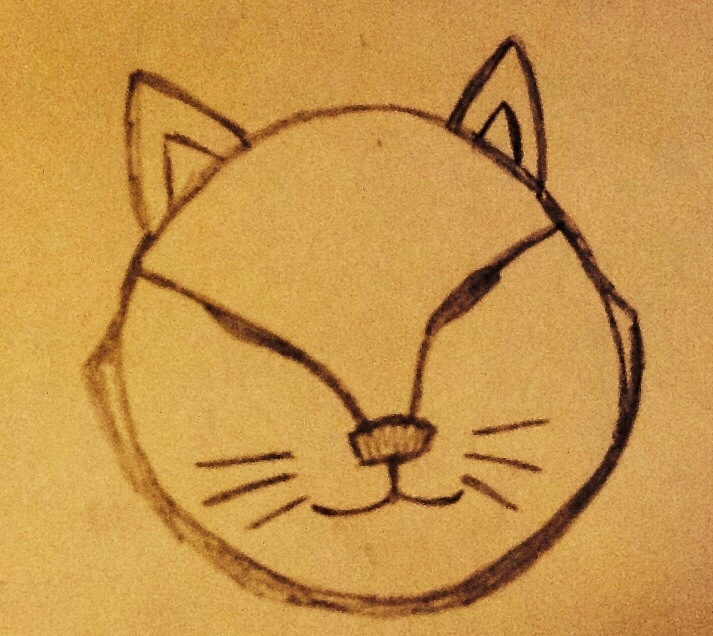 … drawing with ‘fire’ and March Free Giveaway Contest! Update on Free Giveaway! 🙂 Let’s burn some biscuits and sweets (which are no larger than a polo mint)! Wondered what to that Tee-shirt you child has grown out of? 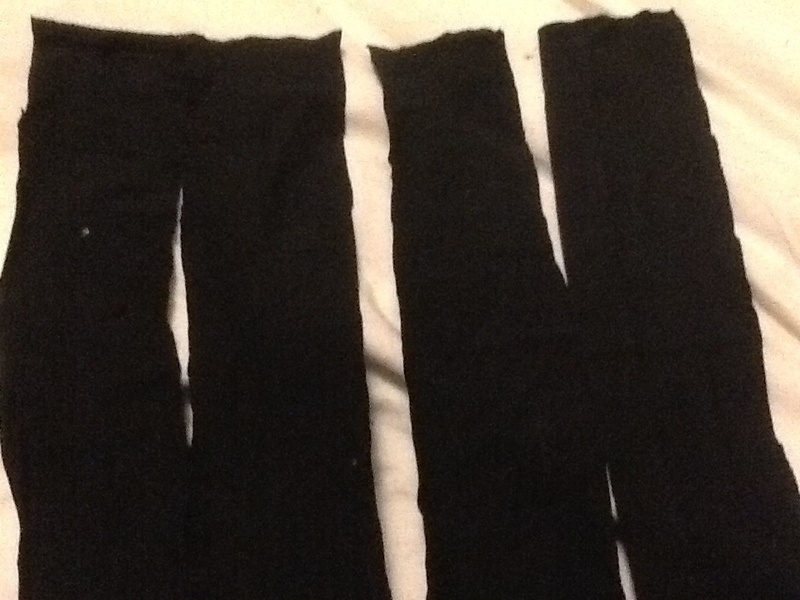 I chopped up a plain black Tee into strips from seam to seam horizontally. 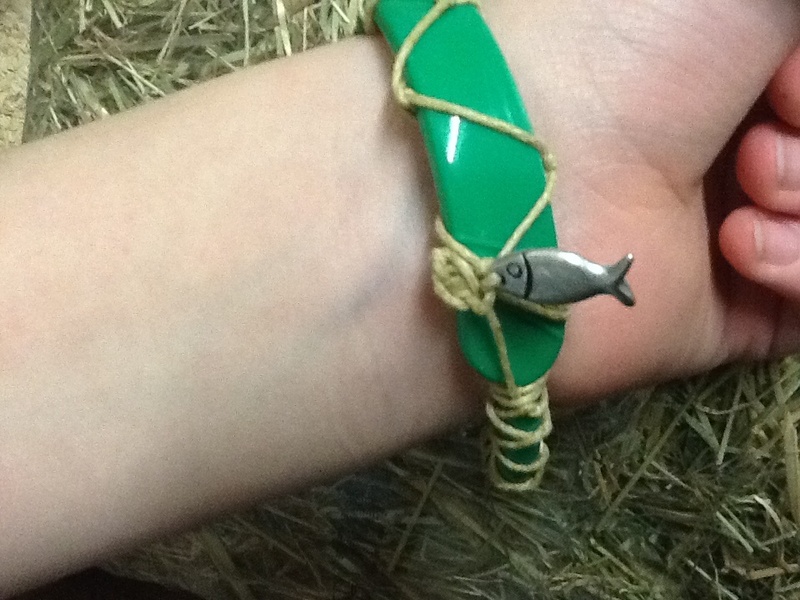 Then, attaching the strips at the top, I plaited them using four lengths and weaving the first through the other three until it was the right size to fit my daughter’s wrist. 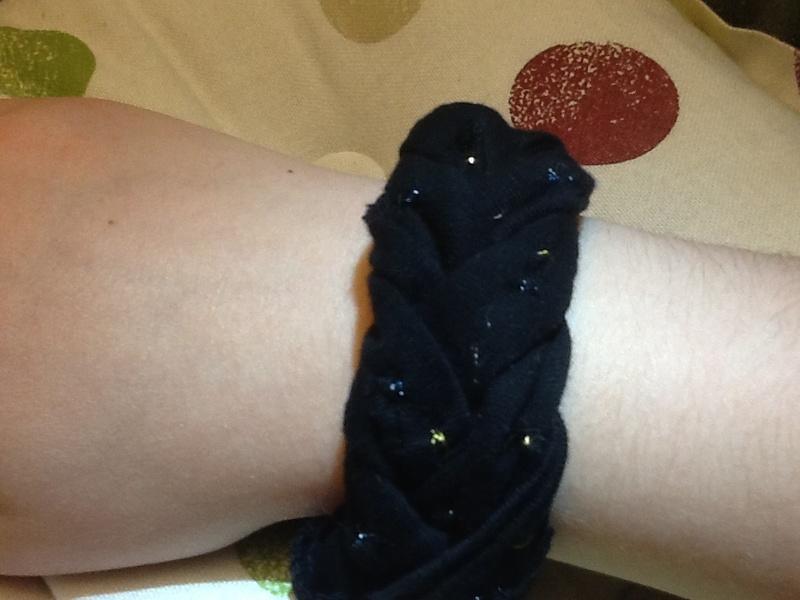 Using the metallic thread I had in my sewing kit, I stitched small dots periodically around the bangle to give it that sparkly appeal and bring out the plait pattern. 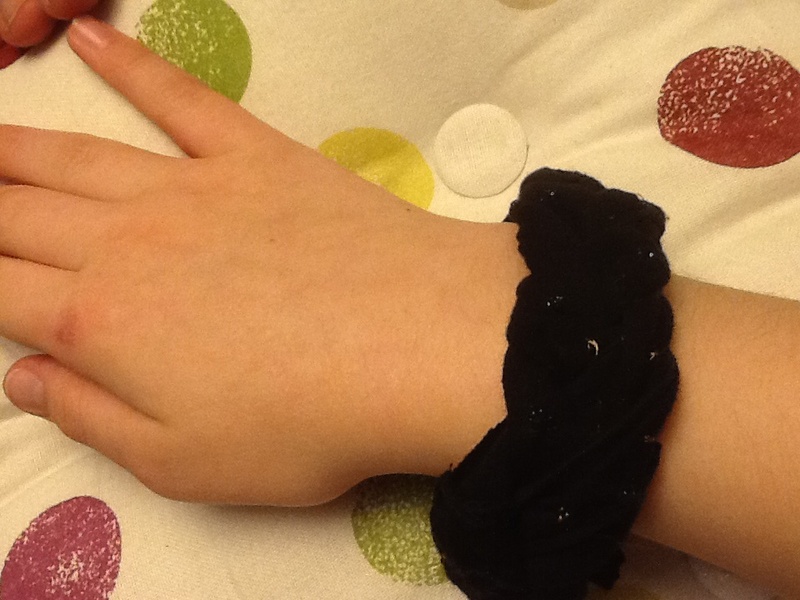 My daughter loves it and in return, she made me an elastic band bracelet!